One of the sturdiest of our natural fibre ropes, manila rope can withstand heavy loads, salt water and sunlight to remain in a reliable condition for extended periods of exposure. Rope Services Direct makes bespoke manila rope to order and customers can trust us to deliver outstanding quality every time. Natural fibre ropes may not be as hard-wearing as their man-made equivalents, but manila rope comes surprisingly close. It is sourced from the Abaca plant and is able to rebuff the effects of exposure to marine environments. Manila ropes will remain in one piece even when it is regularly subjected to the punishing UV rays of the sun. Highly suitable for outdoor use, whether at the local yacht club, on your garden decking or in an agricultural setting. We have a great range of other decking ropes to choose from on their own dedicated page. The wire rope we sell can be manufactured to a specific length, which it will retain throughout its life. 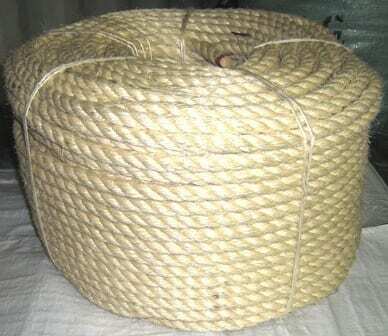 Manila rope, on the other hand, will shrink after coming in contact with moisture. We recommend soaking it thoroughly before first use so that this shrinkage occurs immediately. Its length can contract by up to a tenth, so adjust your order accordingly and ask us for advice if you are uncertain. The rope is available in numerous diameters from 6mm up to 60mm so there should be a size to suit your needs. Let us answer your manila rope questions today. We can be reached by calling 01384 78004, while our email address and other contact info can be found on our site. Our team will get back to you with expert advice on all your natural fibre rope queries. Manila Rope Overall rating: 5 out of 5 based on 6 reviews.